Guild Team Deathmatch now enters the second stage of the open beta-testing. Minimum bid for the game is now 5 Cashpoints. Achievements Gladiator and Meat are not credited on the event, only Killer and Victim (kills and deaths in PvP). In the future, we are planning to create a Hall of Fame for the winners and organize a platform for conducting organized TDM tournaments between guilds. You can find all the information about Guild TDM and put forward your suggestions here. Once again changes to the Guild Buff calculation formulas. Critical Damage and Damage PvP were increased by 30%. Experience Gain modifier has been increased 10 times, but its maximum cap was set to 15%. Guild Masters now will get the maximum possible increase in experience of 15% at 500 guild buff points and normal guild members at 1250. This should encourage players to more actively join guilds and stimulate the development of common guilds. Slogan – join a guild and get +15% to experience for free! Another changes to the Castle Siege, we continue pursuing the goal of complicating the process of breaking through the fortifications of the castle. Now the Canon Towers are being simply ignored by the attacking side, so we have increased its damage from 20% to 40% of the target’s maximum health. We are trying to ensure that their destruction becomes as compulsory as the destruction of other objects on the siege. In addition, health regeneration provided by Guardian Statues for the defending was significantly increased. Regeneration rates depend on the statues upgrade level. The game client has been updated. All players need to auto-update via Launcher. To get the auto-update, close the game, close the Launcher and then start it again. If you have problems with auto-update, you can manually download and install the Patcher, it must be unpacked in the folder with the game client, replacing all of the proposed files. Guild Buff has been updated. Now all character modifiers (except Experience) are absolute, not percent values, like it used to be. There are few new parameters: Critical Damage and Additional Damage PvP. Due to this, the buff will have less influence on strong characters, but will significantly help the weaker. This will favorably affect the overall balance of characters and guilds. Also, we now can change the buff values in real time without restarting the servers, which will allow us to find the golden mean. As we assume that current figures might not be satisfying for everybody. Defending side on the Castle Siege now will not be able do damage their mercenaries: Battle Guard Archer and Battle Guard Spearman. Guards and Canon towers were reinforced, now they are tougher and deal more damage. Also, a bug, due to which Canon Towers constantly missed characters, was fixed. Now towers will inflict damage with 99% probability. Damage to Castle Gates and Castle Statues without the effect of a Siege Potion has been decreased from 5% to 2.5%, it will decrease collateral damage from the defending side. Dark Lords will no longer be able to teleport players through closed gates using Summon skill. All these changes should significantly influence the way that sieges are played. It will encourage the defending side to restore their gates before siege, place mercenaries to protect gates and statues and make plays around defending their objects. Small addition: Success rates for Devil Square invitation mix were tweaked. Now they fully correspond to the figures that you see in your game client. That time has come when citizens of server Epic are going the long-awaited trip – Muxglobal Epic merges with Muxglobal Phobos. Server Phobos opened its doors in autumn of 2016, has more than 300 active players every day, 8000 created characters and it was one of our most hyped servers. Epic players will be transferred to Phobos. Your characters with items, resets bonuses will be moved safe and sound. Servers Epic and Phobos will be turned off on Thursday 11.05.2017 at 13:00, then the merging process will take place. Merged server Phobos will open the same day at 21:00. There is an update for our anti-cheat system. Do not forget keep the version of your game client up to date. Soon without the latest update, you won’t be able to enter the game. Objects on the Castle Siege were reinforced. Canon Tower and Battle Guard HP doubled. On-hit Canon Tower damage is increased to 20% of the player’s maximum health, Battle Guard Spearman to 8% and Battle Guard Archer to 4%. Do not forget that HP of all objects during siege depends on the total amount of stats of the lord castle owner. Items grade has now more impact on the overall Set Bonus. Now the difference in Set Bonus between items with different grades, but the same options will be a little more noticeable. Since Werewolf Hero is no longer a boss, we have adjusted its numbers in quest 163. Also, due to the fact that the number of monsters in Crywolf has increased significantly, the respawn time of all mobs on this location has changed from 10 to 20 seconds. All new items from the last update are already available in our Bonuses Shop, Grand Shop and in the Lottery. We have increased the durability of Blood Castle Gates and Statues on server Aurora. The most dramatic changes are in BC7, other floors were not affected as much. The game client has been updated. All players need to auto-update via Launcher. To get the auto-update, close the game, close the Launcher and then start it again. If you have problems with auto-update, you can manually download and install the Patcher, it must be unpacked in the folder with the game client, replacing all of the proposed files. In addition, full client on the website has been updated; it already has existing updated preinstalled. 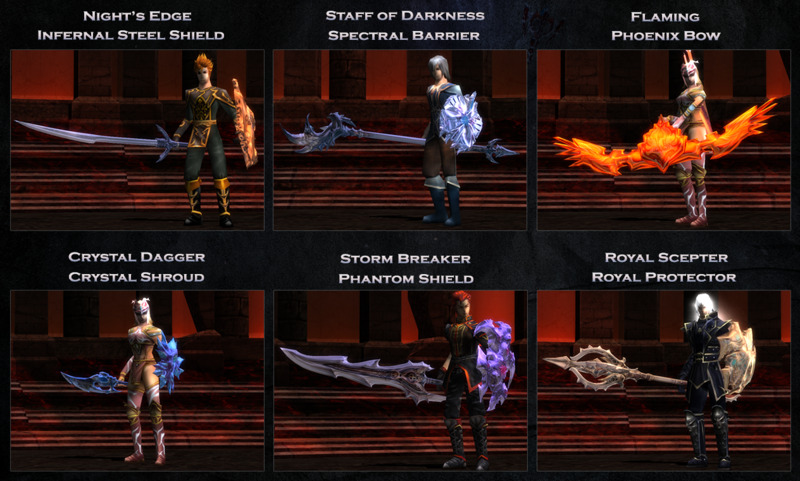 New items were implemented into the game – a weapon and a shield for each class. All top graded items were added to excellent drop from Green Mystery Box (LBA Event and Lord Mix). Accompanying that, all existing weapons and armors in the game were added to the common (Non-Exc) drop from monsters. And the most tasty bits are now hidden in the Star of Sacred Birth, without any upgrades of course. So, do not panic when you get Flameberge from a Star or Brave Armor in Crywolf. The range of items in the shop on the website will be complemented with the new items in the near future. To sustain Non-Exc high-grade items in common drop we have changed the gradations of monsters in Crywolf. Concerning this, we had to say goodbye to the 10 Bless Bundle from Werewolf Hero. Nevertheless, now everyone will be able to try on the best items in the game. We have greatly improved the drop from Balgass, now he drops only top-graded weapons, from Sword Bracker to Night’s Edge. Along with that, the power of the boss and his entourage was significantly increased. Full information about all the changes of the loot from bosses and boxes will be available on the forum soon. Now there is an extended information of items characteristics on the website. Grade – it influences Set Bonus and determines the power of monster that drops certain item. Base Damage and Defense – base stats of in item in non-exc, non-upgraded state. Wield, attack speed and class compatibility. In the future, we will try to display current item parameters according to the item sharpening and state. Anyway, even base stats should significantly help players to navigate around items power levels, especially against the background of new weapons. Due to the fact that the mighty bosses of Land of Trials did not get along with AFK lovers, it was decided to remove all spots from LoT. The location became a pure farm-zone – only hunting for a valuable loot and no AFK. Bosses and rabbits were slightly altered. Several Fortune Pouches arrived to the scenery; by the way, their respawn on all locations except Bless Arena is now 30 minutes. Instead, the castle lords get a modest command /stadium which moves you to its own private Stadium with 13 spots form leveling up, Zen spot and a couple of nice extras. Of course our lords won’t be able become self-indulgent, the spots hardly reach the level of Twin Tail in BA, but in any case a safe AFK is provided at its finest. And by the way, DL Summon skills words in Stadium, so if you want you can arrange tourist excursions. And finally: the level for Summon skill were corrected, GM’s got their right to use Shield Defense Skill on the crown back, and Destroy set was renamed to Phantom (do not even ask why).